Our 250gm soap nut berries give you 3 months worth of washing, based on one load per day. That works out to less than 17 cents a wash! Use these soap nuts for washing in both top loader and front loader machines, as well as using to clean your bathrooms, benches and floors – click here to see how making the soap nut liquid from these soap berries gives you loads of options to reduce your households toxic load. The 250gm size is a great introduction to using a natural laundry detergent in your home, once you see how they work you can save even more money per load with the 500gm soap nut bag. Our soap nuts are packaged in a calico drawstring bag for easy use, there is also an internal plastic bag to ensure your soap nuts stay dry and active. 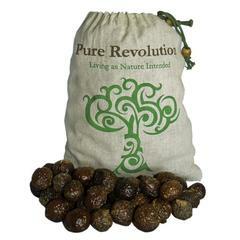 Provided in each supply of our natural soap nuts is also the small calico bag to use in the washing machine. 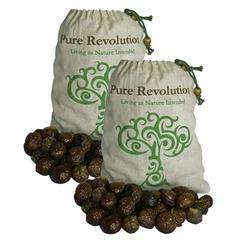 Full instructions for use including making the soap nut liquid are printed on the back of every Pure Revolution bag of natural soap nuts. AND you can rest assured you are reducing your families toxic chemical load, one wash at a time!